The Portland Trail Blazers’ talented young point guard is playing really well. The Cleveland Cavaliers’ talented young point guard may be playing even better. Damian Lillard leads the Trail Blazers into Cleveland against Kyrie Irving and the Cavaliers on Tuesday night. Irving was named Eastern Conference Player of the Week on Monday after averaging 29.0 points and 6.3 assists while shooting 50.8 percent in three games last week. Irving also averaged 2.3 steals, shot 9 for 22 (40.9 percent) from 3-point range and made 14 of 15 free throws. 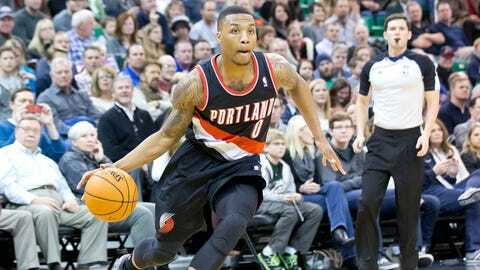 Squaring off with Irving will be Lillard, who is coming off a special performance of his own. Lillard sank a fadeaway jumper as time expired to give Portland (21-4) a 111-109 overtime victory at Detroit on Sunday. The point guards have faced off only once before. Irving had 31 points while Lillard was held to 13 on 3-of-9 shooting in Cleveland’s 93-88 win at Portland on Jan. 16 that ended a four-game skid in the series. However, this season’s Portland team is much deeper and talented than last year’s version. The Trail Blazers have the best record in the West thanks to an efficient, high-scoring offense. Portland averages 107.9 points and shoots 45.9 percent, both of which rank near the top of the NBA. Power forward LaMarcus Aldridge was just named the West’s player of the week for the third time this season after averaging 25.5 points in the Blazers’ four wins last week. He also tied a season high with three blocks as Portland held Detroit to 15 in the fourth quarter after allowing 33 in the third to fall behind by 11. The Cavaliers (9-14), who had a three-game win streak snapped with a 114-107 loss at Miami on Saturday, know they will have their hands full. Outside of Irving, nobody on the roster scores more than 14.5 points per game, and the Cavaliers average 94.4 points. With so many young players, they see the Trail Blazers as a team they would like to one day become. Portland has won its first 10 games of a season against the Eastern Conference for the second time in franchise history, matching the mark from 1990-91.